Home / Blog / The City of Jeonju and Animal Protection Group Work Together to Send Rescued Dogs from Osongje to Their Forever Homes! 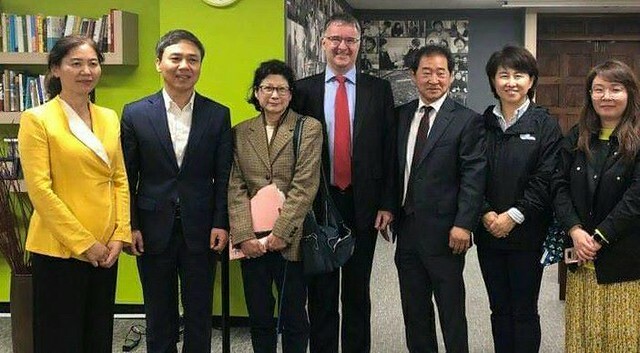 Photo: From the left, Gina Nam, Mayor Seong-Su Kim, Nami Kim (SaveKoreanDogs.org), Mark (Gina’s husband), Dr. Chae-Woong Im of Jeonbuk National University College of Veterinary Medicine, and Commissioner Jeong-Hee Park of the Jeonbuk Environmental Protection Association. Nami Kim and her organization, SaveKoreanDogs.org, supported the city of Jeonju and the local animal protection group in closing down a dog farm, which had been illegally occupying the Ministry of Defense’s land for the past 20 years, by assisting with the care and adoption processes of the 10 dogs rescued from the farm. They also met with the mayor of Jeonju, Kim Seong-Su, to thank him for his support and to urge him to end the dog meat industry in his city. Will Jeonju become a dog meat-free city? Nami seems to be encouraged by the meeting. She travelled 10 hours round trip to attend this meeting and said it was well worth the trip. Nami said that Jeonju is one city with a separate animal welfare unit in the city government, whereas 99% of Korean cities’ animal welfare is handled by the Animal Disease Control Department or Livestock Management Department. Nami said that Jeonju could be another city moving towards becoming dog meat free, and that Mayor Kim is young and will be re-elected in June. SaveKoreanDogs.org will be helping the city in this effort by analyzing the numbers of dog meat farms and dog meat restaurants in the city. There is so much work that SaveKoreanDogs.org needs to do together with the city, and she asks that we write Mayor Kim and thank him for his decision. He reads and writes English. Mayor Kim’s email is: whylocal@hanmail.net. Thank you, Gina Nam and the members of Action for Animals!! Click HERE to see more photos of their meeting. Click HERE to see our Sister/Friendship city campaigns targeting Jeonju. Click HERE for the latest updates by Gina Nam about the dogs rescued and the dog farm closing status. Click HERE for the latest updates by SaveKoreanDogs.org. The city of Jeonju announced on the 28th of March, that the 10 dogs rescued from an illegal dog farming operation in Osongje, Songcheon-dong (a district in Jeonju) have entered the adoption process. The dogs, who were being raised at the dog farm until city and regional animal protection groups teamed up to rescue them on the 23rd of March, include one retriever and nine 3 to 6 month-old mixed breed puppies. Photo: From Nami: A “meat dog” has become a star at the Jeonju City Hall. Olivia walked into the mayor’s office, was featured on TV, and had two newspapers covering her story with more to come. Gina and her team, Action for Animals, did a wonderful job. What a fantastic team. The puppies rescued together with Olivia are at the SaveKoreanDogs.org sanctuary preparing for their adoption process. The city shut down the illegal dog farm and worked with the animal protection group “Action for Animals” to convince the farm owner to forfeit ownership of the dogs. After careful consideration with the members of the animal protection/welfare groups, the officials from the environmental and building departments decided to offer the rescued dogs up for adoption. The rescued dogs were temporarily sheltered at Jeonbuk National University before being transferred to a sanctuary operated by the animal protection group, SaveKoreanDogs.org, located in Gimpo, Gyeonggi-do Province. The dogs will continue to receive care until they find new families in the U.S. or Canada. The city is also looking for a buyer for the goats that were confiscated along with the dogs. Five representatives of the organizations involved, met with the mayor of Jeonju, Seung-Su Kim, to show gratitude for his support and assistance with the rescue. 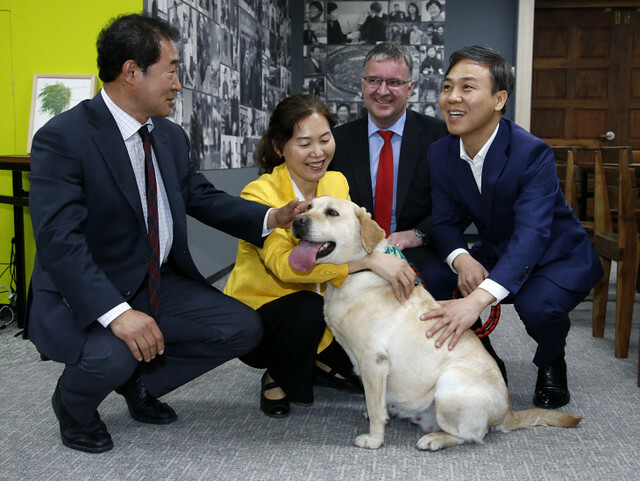 They included Dr. Chae-Woong Im of Jeonbuk National University’s Veterinary School, Commissioner Jeong-Hee Park of the Jeonbuk Environmental Protection Association, Ji-Sook Nam of Action for Animals, Nami Kim of SaveKoreanDogs.org. Osong (Olivia), the 3-year-old rescued retriever, happily accompanied her rescuers on the visit. The representatives also delivered a message on behalf of the Jeonju residents, asking that the mayor ban dog meat and to support animal protection efforts. Last year, the city of Jeonju created an animal welfare group in an effort to improve animal welfare policies and projects, and has pursued research projects to create an animal welfare master plan for the city. Through the research project, the city plans to: conduct a survey among companion and livestock animals related occupational groups on animal welfare, and their perception of animals; establish basic direction and policy goals on animal welfare for the city; identify detailed strategic projects based on the policy goals; and build an animal welfare system that encourages participation of all classes of residents. Please donate to SaveKoreanDogs.org so that they can continue their rescue and fight against the dog meat trade in South Korea. We just liberated the dog farm near our apartment for the second time! The dog farmer broke his promise and the contract he signed 1.5 years ago to refrain from such activity. We are looking into whether we can sue him. After a huge media campaign we were able to convince Jeonju city to help us liberate the dog farm again. This time the city and the Korean military will hopefully shut this horrible place down by force! The dogs were rescued this afternoon. Here’s a video of today’s rescue. We could not have rescued these dogs without the help of Action for Animals (rescue) and SaveKoreanDogs.org (adoption). A big THANK YOU to all! Video: Gina Nam. Osong being rescued on March 22, 2018. Video: Gina Nam. This is video of this dog farm from back in June of 2016 when the dog farmer promised to close down the dog farm. He broke his promise and was continuing to farm/slaughter dogs. THANKYOU SO MUCH, THERE ARE SOME VERY KIND GOOD KOREANS, THAT IS SO GOOD TO KNOW. This is wonderful news. Great to see official support to change the lives of dogs for the better. Thank you for your tireless efforts!! How come the cat meat industry is not mentioned very often? I thank God for the men and women who continue to fight to save these precious animals. Thank you so much! And please, please, please continue your wonderful work!!! Thank You For Everything You Do ! Let’s Going On Together ! Let’s Make Stop This Evil Market ( dog and cat meat ) . E.Gomis from France .